Have you been meaning to learn how to use that DSLR Camera you received from Christmas two years ago? This is what we most commonly hear at our beginner’s “Introduction to Digital Photography” Workshop. In this workshop we teach new users to shoot on manual mode on their DSLR cameras. What does that mean? Well we teach you how to set your settings on your camera so that you have complete control, instead of your camera guessing what settings you want to use. In manual mode we teach how to set the White Balance, ISO, Shutter Speed and Aperture on your DSLR camera. This helps you achieve perfect exposure resulting in the shot you envision! Our Introduction workshop is our instructors favorite to teach as it is quite the sight to see it “Click” for you for the very first time! 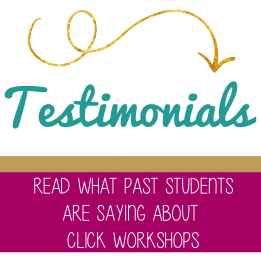 Don’t delay, register today to sign up for your Click Workshop and see what all the fuss is about! © 2019 Photography Studios in Atlanta | Click Photography Studio|ProPhoto Photo Theme Designed with love by Seaside Creative.